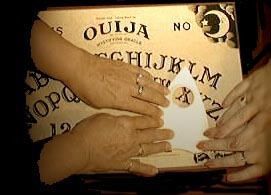 The Dominicans of Christianity claim that the Ouija Board is a tool of satan. Many belive that only evil can be contacted with the game. If this is true and a person can really contact demons, is it possible for a person to be entrapped by playing the Ouija Board? This idea was used in the 1975 film " The Exorcist". A young girl uses a Ouija Board to communicate with a dark force ( Capitan Howdy) and becomes possesed. The film is loosely base on actual events that took place in Mount Rainier, Maryland in 1945. A 14 year old boy was alledgedly possesed by an evil spirit which would cause him to suffer violent attacks and through fits of rage. Eyewitnesses claim that scratching noises emamated from the walls, objects such as fruit and pitures would leap to the floor in the boys presence, and the bed in which the boy slept would shake violently. The boy was eventually freed from the demon by the ritual of exorcism and went on to lead a normal life. Later a freind of the boy was interviewed about the events. He claimed that the boy was smothered by his obsessibly religious parents and grandmother who held deep intrest in spiritulism and Ouija Boards. Could the Ouija be to blame for these strange events? This idea was used in the 1975 film " The Exorcist". A young girl uses a Ouija Board to communicate with a dark force ( Capitan Howdy) and becomes possesed. The film is loosely base on actual events that took place in Mount Rainier, Maryland in 1945. Are spirits merely emanations,influences or power? There are three attributes of personalities.If it can be proven that something has all three attributes then something is a personality.Right? These three attributes are Intellect,Emotion,and will.First do demons have intellect?Yes...Demons know their own future doom nd the future doom of others,Demons have a counterfeit system of doctrine and have the ability to communicate such as automatic writing,speech table tapping and The Ouija Board.Second do demons have emotions?Yes..this can be seen in two ways they have the emotion of feircness and anger,and second they have the emotion of fear.Third do demons have will?Yes...This can be seen for the fact that demons have the will to make and take commands and they have the will to leave a person and find a new place or go back to the place before.. This all comes in with the Oujia Board for the fact that when you are playing the ouija bpard the demons(spirit)knows a the answer to all the questions you ask.This shows intellect.The spirit your talking to sometimes can get angry with you for things you say this shows emotion.And the spirit you are talking to also obey's commands the player makes and it makes commands.and when a person becomes possesed the demon has the choice to leave if it wants.this shows will.So is a demon(sprit) really a personality?seems hard to believe but it all comes back to the simple fact that a demon has all three attributes of personality so that makes it a personality.Right? How does a person get possessed?The more spiritual sensitivity you have the more open you are to possession,risk activities involve;Burn charming,Pendulum diagnosis,Yin-Yang,Ghost's trance diagnosis,Birth stones,Metaphysical healing and drugs,The stages of possession are. ~Of the mind speecha nd some body movements. ~Person might talk aloud to the spirits. ~person hears spirit voices that confuse thinking patterns and hinder concentration needed for school,work and normal life. ~Fear that the person cant control or stop the spirit. ~Thoughts of suicide are frequent and uncontrolled. ~Faster movements in the head,arms,and fingers only when the person loses control. ~Says something not related to the situation being talked about. ~Shows agitation by swearing and cursing. ~Not able to function in life. ~Needs to be institutionalized or commits suicide. 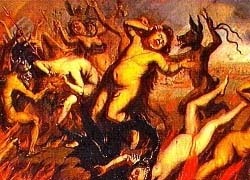 ~The Doctors diagnosis is Mental insanity.